Journalist John Seigenthaler describes Edmondson’s world during an interview in April, 2014. I admit I procrastinated. Waves of insecurity had washed over me and I nearly didn’t call. I’m basically a shy person and interviewing a Famous Journalist was way outside my comfort zone. But he’d been so warm and welcoming and down-to-earth, and so I pushed through my hesitation. I made the call and his assistant Gay set an appointment for April 21, 2014, at 2:00PM. I had asked for an hour of John’s time. I arrived at the First Amendment Center offices, inside the Seigenthaler Center building, at one o’clock to set up my gear. Yes, I was relieved that John was running late. I’m producing this documentary on a shoestring, accepting volunteer help when I can, but often working alone by necessity. Today I would be handling the interview myself…putting up lights, aiming the camera, and asking the questions. I’m confident about tech stuff, but my experience with conducting interviews is somewhat limited, and I figured that if I were unprepared or unfocused, John would see right through me and I would be toast. My plan had been to set up with plenty of time to spare, so I could go over my questions and get myself in “the zone”. But setting up had gone slowly and I was feeling pressed as two o’clock approached. Two o’clock came and went. Gay allowed as how this was not unusual, as John’s meetings often go long. He enjoys people and conversation, she explained apologetically. No worries. I was grateful for the extra time to focus my thoughts. John arrived about 2:30, dressed casually but nattily, in a crisply-pressed oxford shirt and v-neck cardigan sweater. He apologized for keeping me waiting, and said he hoped his outfit was not too informal. I assured him that it was fine. Pleasantries out of the way, we settled in. Mic clipped on, lights adjusted, deep breath. Our conversation was wide-ranging, illuminating, and entertaining. John spoke about his native Nashville from both his keen journalistic perspective and his personal lived experience. His insights, observations, and anecdotes flowed effortlessly, in a seemingly endless stream. Our scheduled one-hour conversation stretched into two, then to nearly three. Inwardly, I was a little concerned that I was imposing on his time, but I followed John’s lead, and he seemed to be enjoying himself thoroughly. Finally, Gay poked her head in the door and gently reminded him that he was already late for his next appointment, down at the Tennessean offices. As I quickly wound the interview down, I realized that, amidst all of John’s wonderful and detailed stories, we had only covered a portion of what I had originally intended. I asked John if he would be willing to invite me back sometime for a quick followup interview. The next afternoon I arrived extra-early to set up my gear. Just like the day before, John was out of the office at a meeting when I got there. He arrived right on time. We had another great conversation. John seemed eager to share everything and anything that might shed light on my subject, and he expressed great interest in hearing all about what I had learned in previous interviews and research. He shared words of encouragement, and we spoke about how important stories get lost to history because folks tend to doubt that their own lives are important or interesting to others. I sensed that, as a newspaperman with a passion for “ordinary folks”, he understood this as deeply as anyone. “I don’t know how much time I have left,” he said, by way of explaining his generous willingness to share his knowledge and perspective with me. I had no idea that he was sick. That day, John Seigenthaler and I talked on-camera for another two and a half hours. Nearly six hours over two days. By the time we finished, Gay’s office was dark and silent. The halls of the First Amendment Center were empty, all of the other tenants of the Seigenthaler Center were also long gone for the day. I packed up my gear and loaded most of it on a pushcart, preparing to push it with one hand while I tugged my wheeled camera bag behind me with the other. “Can I help you with some of that?” John’s offer caught me by surprise. “Well…sure”, I hesitated, almost embarrassed to accept his help. “If you want, you can roll my camera bag.” We walked together to the elevator and then through the empty lobby and down the front walkway to the sidewalk. “I’ll wait here with your gear while you pull your car up”, he said. I retrieved my car and, as I pulled up to the front of the building that bears his name across its facade, I was struck by how surreal a sight it was, of John standing alone in the waning afternoon light, guarding my overflowing cart. “Hey John”, I joked. “I wanna take a picture of you to post on Facebook. Otherwise nobody will believe that John Seigenthaler schlepped my gear for me today.” He smiled and let out a chuckle. I didn’t take the photo. I loaded up the car, then I shook his hand, thanked him again for his generosity, and assured him that I would keep him posted on the film’s progress. I drove off reflecting gratefully on how I’d just spent rich and rewarding days with a great and humble man. “Mark,” my wife called to me earlier this week. “I just got a text that John Seigenthaler is in hospice care.” A friend of ours who is also close to John had forwarded this sad news. I can’t claim a close, or longstanding, friendship or professional relationship with John. In his long and storied life and career, he befriended, mentored, and personally touched countless individuals. Through his tireless work and advocacy, he had made life better for countless more. His memory will tower over Nashville and our nation for a long time to come, and well it should. It’s appropriate to measure the greatness of a man or woman for the way they use their public platform—for the power of their prose or the reach of their good works. 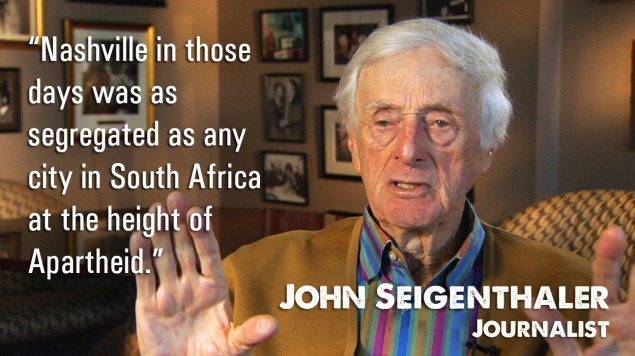 By that measure, John Seigenthaler was indisputably a great man. But, having been behind the camera on countless occasions when celebrities, politicians and public figures of all stripes were in front of it, I also appreciate the value of what happens when the camera is off…after the spotlight has been doused. I am touched and grateful not only for the gift of his time and the interview he gave, but also for the little gestures of kindness at the end of our visit. Godspeed, Mr. Seigenthaler. Thank you for your stories, your generosity, and your humanity. And thanks for helping me schlep my gear.